Every bit of message communicated undergoes a certain process involving more than one person. Nobody communicates to a vacuum or wilderness. Communication is considered effective if it receives the desired result, response or reaction. All Communications are related to some context. In any context, a communication loop exists to enable successful communication. At one end of the loop is the sender of a message or information. He receives a stimulus to send a message across. The stimulus may be external or internal. There might be an urging from an outside source which is external stimulus. The internal stimulus might be a desire from within the person to send across a message or information. He converts the message into a code. This process is called encoding. The sender is also called the encoder. He chooses the appropriate verbal or non­verbal code and puts the message into that code. Then the encoder transmits the coded message through an appropriate medium. The sender or encoder chooses the appropriate medium based on several factors such as the receiver, the message, its urgency or otherwise. He may choose a non-verbal signal, body language, speech, writing or any other available medium to transmit the encoded message. The message gets transmitted to the receiver. The receiver decodes the message and perceives it. Unless the receiver is aware of the code and is adept in using the medium, he cannot decode it. Misinterpretation may arise even if there is interference in the medium. The receiver’s response or reaction is the feed back that the sender gets. The feedback may again be a signal or an action. In short communication is related to the context. Context is determined by country and culture generally and the individual’s mindset and attitude particularly. Environment and the stimuli, external or internal determine the actual process of communication. The sender in response to an external or internal stimulus perceives a message. He puts it into an appropriate code of verbal or non-verbal symbols. He transmits it across to the receiver through an appropriate medium. This act of the sender is conditioned by his mental attitude, his experience and his perception of all the related factors. The receiver, based on his experience, attitude and perception of all related factors decodes the message, interprets it and reacts or responds to it. We should remember that the sender and the receiver should share a symbol that will carry the same meaning for both. If they do not, misunderstanding is bound to occur. If the boss asks his subordinate to present a bimonthly report to him, he may expect a report every fortnight. But the subordinate may think that he has to send a report once in two months. Bimonthly means both, twice in a month or once in two months. Misunderstanding has arisen because the word ‘bimonthly’ means two different things to the boss and the subordinate, both of which are correct. The code used in this context is the English word’ bimonthly’. The code stands for two concepts and its use has led to the misunderstanding. The boss would have said ‘a fortnightly’ report or reports twice a month or the employee could have got the message reconfirmed by a specific question. That is why the sender and the receiver should share the code / symbol with clarity. The choice of the symbol for encoding and the medium of transmission play an important role in the process of communication. Effective communication takes place if all the parameters like the encoder, his mental attitude, capacity to encode and transmit, the medium, the decoder/and his capacity to decode that specific message are equal to the demands of the communication exercise. The message is the core idea a sender wants to communicate. The sender should carefully decide upon the precise message that he wants to communicate and its purpose. He should take into consideration the context of his communication and the attitude of the receiver. Based on these factors, the sender should choose the code and the medium for transmitting the code. The receiver should be familiar with the code and be competent to access the medium of transmission. The sender cannot e-mail a message to a receiver who is not computer savvy nor can he write a letter to an illiterate. The choice of the medium also depends on the urgency of the message. If the sender wants an urgent feed back, he should choose the oral medium. You cannot afford to write long memos or letters to a workman on the shop-floor. Instead a face-to-face meeting with brief instructions will produce the desired results. 1. Is that transactional process = process of communication? 2. Could you please post about the information of ‘type of communication’? These requirements are really urgent. Please reply me as soon as you can. your page is great.could i ask some question 4m u? and what are the “communication types? can you send me the answer for those problems as soon as possible. body language has often been neglected as an important tool of communication, why is so? I would like to provide a link to this website for my students. Would that be possible? Please contact me. Thanks. 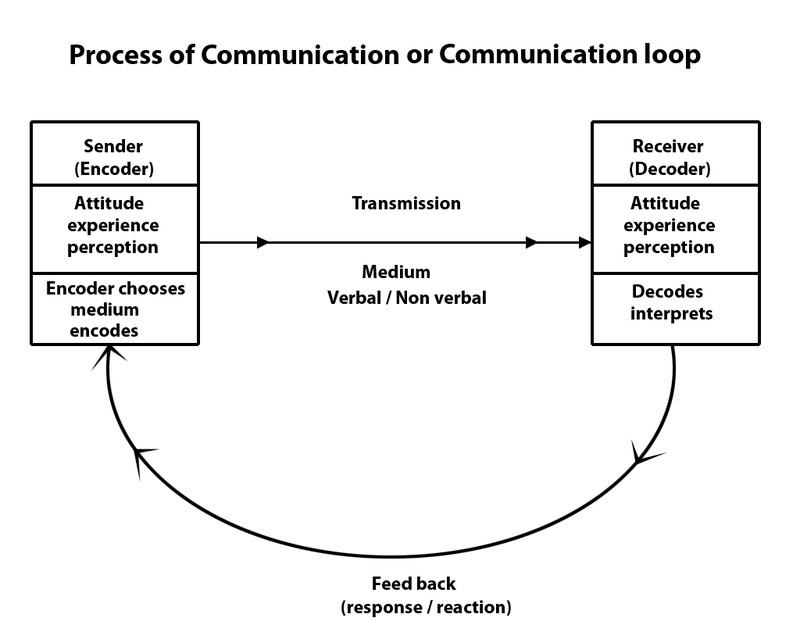 Most interesting, the communication loop looks like a basic tools for all managers and HR professionals. Hope you’ll be posting more on the subject soon! Can you please put up an example of the 8 elements of communication,for example: sender,encoding,message,receiver,decoding,channel,feedback,noise. please give the answers of question that why sender is called encoder and why receiver is called decoder? it is your very good page. I want to know, full form of COMMUNICATION. can you please tell me the definition of process theory? – What is the title of this model -process of communication-? – Could you please post about the information of ‘type of communication’? This page is great. pls can u make a list of some of the communication stimuli? List and explain factors that affect communication within an organization.